Put all the ingredients, except the spinach, into a large pan. Rinse out the jalfrezi sauce jar with 100ml hot water and stir into the pan. Cover and bring slowly to simmering point. Simmer gently for 25 minutes until the lamb is cooked and the vegetables are tender. Remove from the heat and stir the spinach into the curry. Cover and return to the heat for 1-2 minutes until the spinach has just wilted. 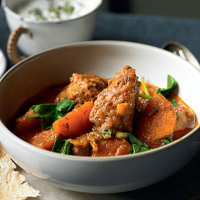 Serve with warm chapattis or basmati rice, with a spoonful of natural yogurt.